Purple Essentials - Natural Skin Care for a pure and simple life! : What is your summer scent? What is your summer scent? Everything seems to refresh and relax as Summer arrives. 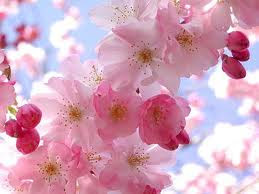 Blossoms bloom, while sweet fragrances flood the air. Our moods are lighter and more joyful. Things sound, look and taste more vibrant. As we crave lighter meals, it only makes sense that the scents we wear should lighten up too. Of course it would be best to adorn yourself with 100% natural and organic aromas and perfumes, for their non toxic ingredients and beneficial aromatherapy properties. When that isn't possible, you can still make a choice to wear your favourite commercial perfume or cologne less often and in lighter doses - to help limit everyone's exposure to the negative effects, that the chemicals used in synthetic perfumes can cause. A variety of the following scents can be blended to create a unique and inviting perfume or cologne. Look for the ones that appeal to you when choosing your Summer Scent. Citrus: tangerine, mandarin, pink grapefruit, lemon, lime, lemon verbena, bergamot. Floral: gardenia, jasmine, tuberose, rose geranium, lavender, ylang ylang. Earthy: cardamom, cedar wood, juniper, sage, sandalwood, vanilla. Tap perfume/scent onto your skin. Rubbing it into the skin can cause the molecules to rupture before they have had a chance to set and release their aroma. Apply scent to pulse points (neck, inner elbow, wrists, behind knees) for longer wear time. The heat of your skin and slight moisture helps to release the scent. Store perfume in a cool, dark spot for a longer shelf life. Light, heat and humidity can breakdown and alter the scent. Scent lingers longer on hydrated skin. One more reason to keep your skin soft and supple with a hydrating moisturizer. Avoid spicy scents on super hot summer days. Full/substantial notes (spicy to musky) are amplified by heat and humidity, and can become overpowering. Spray scent into the air, and walk through mist, to avoid staining white/light clothing and to create a subtle layer of fragrance. Wait a few minutes after applying SPF , before applying your scent of choice. Too close together and the scent can be altered. *Purple Essentials has 3 all natural perfumes on the development table right now.